Substitute the verjuice in this recipe for apple juice and a squeeze of fresh lemon. Preheat the oven to 220c, gas mark 7. Squeeze the juice of one lemon into the cavity of the chicken, then add the rosemary. Mix the verjuice with the juice of the other lemon and the olive oil, then brush this over the skin of the bird, reserving the rest for basting later. 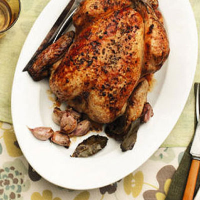 Season the chicken, then cook it on the middle shelf of the oven for 20 minutes. Reduce the oven temperature to 200c, gas mark 6 and turn the chicken onto its breast; baste with some of the verjuice dressing and roast for another 20 minutes. Reduce the oven temperature once again to 180c, gas mark 5. Turn the chicken over and baste with the remaining verjuice mix. Put the garlic in the bottom of the baking dish with the bay leaves and lemon zest and cook for another 30 minutes, or until the juices run clear when the thigh is pierced and there are no signs of pink meat. Remove the chicken from the oven, then allow to rest, on a warm serving plate covered with foil, for 25 minutes. Skim the fat off the liquid in the roasting dish and discard; heat up the liquid to serve with the chicken. Serve with green bean salad and potatoes with capers (both opposite). Maggie Beer Verjuice is available in John Lewis Food Hall. As an alternative, substitute 125ml apple juice and a squeeze of lemon juice for 125ml verjuice.